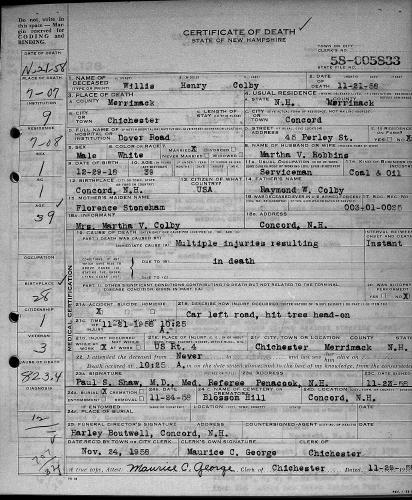 "New Hampshire, Birth Records, Early to 1900," index and images, FamilySearch (https://familysearch.org/pal:/MM9.1.1/FL2T-QF9 : accessed 29 Nov 2012), Walter Lorenzo, 23 Sep 1898. 1900 United States. Census Office. 12th census, 1900 population census schedules, Washington, District of Columbia: Bureau of the Census Micro-Film Laboratory, ([197-]) , Census Place: Manchester Ward 3, Hillsborough, New Hampshire; Roll: 947; Page: 19B; Enumeration District: 0095; FHL microfilm: 1240947. 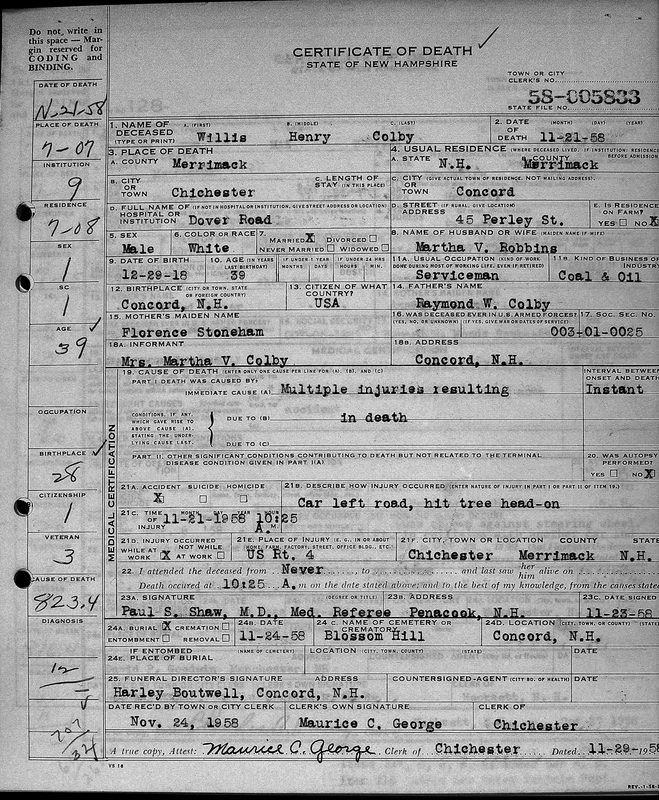 "New Hampshire, Birth Records, Early to 1900," index and images, FamilySearch (https://familysearch.org/pal:/MM9.1.1/FL2T-QXB : accessed 29 Nov 2012), Wesley Haswell, 23 Sep 1898. "New Hampshire, Deaths and Burials, 1784-1949," index, FamilySearch (https://familysearch.org/pal:/MM9.1.1/FDVD-LFD : accessed 29 Nov 2012), Wesley H. Colby, 1898; citing reference , FHL microfilm 2056102. Ezra S. Stearns and William F. Witcher and Edward E. Parker, Genealogical and family history of the state of New Hampshire, New York and Chicago: Lewis Publishing Company, (1908) , Vol. 4, p. 1568. Vital records of Amesbury, Massachusetts to the end of the year 1849, , at https://archive.org/details/vitalrecordsofam00ames . Topsfield, Mass. : Topsfield Historical Society, (1913) , p. 317. Ezra S. Stearns and William F. Witcher and Edward E. Parker, Genealogical and family history of the state of New Hampshire, New York and Chicago: Lewis Publishing Company, (1908) , Vol. 4, p. 1569. "New Hampshire, Births and Christenings, 1714-1904," index, FamilySearch (https://familysearch.org/pal:/MM9.1.1/FDJ8-CLL : accessed 18 February 2015), Iru Mason Colby, 11 Feb 1829; citing BOW TWP,MERRIMACK,NEW HAMPSHIRE; FHL microfilm 1,000,378. Willard married Mary Blake Kimball. 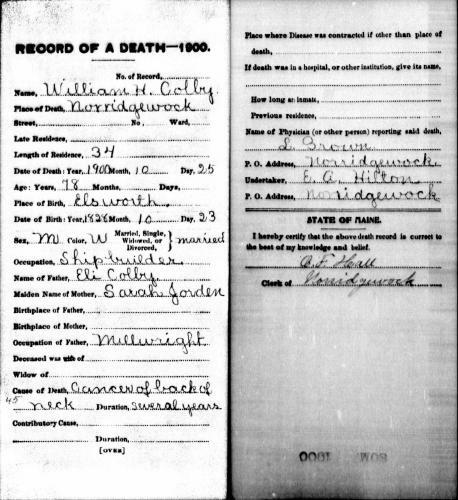 "New Hampshire, Death Records, 1654-1947," index and images, FamilySearch (https://familysearch.org/pal:/MM9.1.1/FSKJ-G4B : accessed 02 Dec 2012), Willard M Colby, 28 Mar 1887. World War I Draft Registration Cards, 1917-1918, at http://content.ancestry.com, National Archives and Records Administration (NARA); Washington, D.C.; Consolidated Lists of Civil War Draft Registration Records (Provost Marshal General's Bureau; Consolidated Enrollment Lists, 1863-1865); Record Group: 110, Records of the Provost Marshal General's Bureau (Civil War); Collection Name: Consolidated Enrollment Lists, 1863-1865 (Civil War Union Draft Records); ARC Identifier: 4213514; Archive Volume Number: 2 of 2. 1880 United States. Census Office. 10th census, 1880 federal population census, Washington, District of Columbia: National Archives and Records Service, ([19--]) , Census Place: Dunburton, Merrimack, New Hampshire; Roll: T9_766; Family History Film: 1254766; Page: 255.3000; Enumeration District: 176; Image: 0339. COLBY FAMILY & OTHERS, at http://freepages.genealogy.rootsweb.com/~colby/colbyfamciting FHL Number 1000976; Marriage: Hannah L. BROWN, Date: 05 Dec 1826; Recorded in: Birth and Marriage Index for New Hampshire. COLBY FAMILY & OTHERS at http://freepages.genealogy.rootsweb.com/~colby/colbyfam, /d219.html. "New Hampshire Births and Christenings, 1714-1904," database, FamilySearch (https://familysearch.org/ark:/61903/1:1:FDJ8-ZW1 : 12 December 2014), Samuel Murray Colby, 10 Oct 1832; citing ; FHL microfilm 1,000,378. Harrison Colby, A genealogy of the descendants of Abraham Colby and Elizabeth Blaisdell, his wife, who settled in Bow in 1768, , at https://archive.org/details/genealogyofdesce00colb . Concord, N.H.: Printed by the Republican Press Association, (1895) Microfilm #896944 of the Family History Library, Salt Lake City, Utah, p. 145. 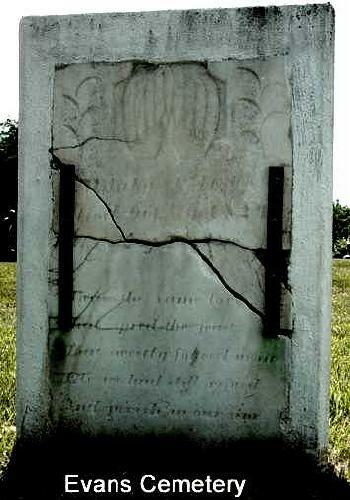 He was the son of Caleb S. Colby and Sarah Jane Emerson. living at 216½ 4½ Street S, Minneapolis, Hennepin County, Minnesota. 1900 United States. Census Office. 12th census, 1900 population census schedules, Washington, District of Columbia: Bureau of the Census Micro-Film Laboratory, ([197-]) , Census Place: Minneapolis Ward 4, Hennepin, Minnesota; Roll: 766; Page: 12A; Enumeration District: 0035; FHL microfilm: 1240766. 1910 United States. Bureau of the Census. 13th census, 1910 population census schedules, Washington, District of Columbia: Bureau of Census Micro-Film Lab, ([19--?]) , Census Place: Minneapolis Ward 4, Hennepin, Minnesota; Roll: T624_701; Page: 5B; Enumeration District: 0078; ; FHL microfilm: 1374714. Ancestry.com, U.S. City Directories, 1821-1989 (Beta), [database on-line]. Provo, UT, USA: Ancestry.com Operations, Inc., (2011) , Minnesota > Minneapolis > 1930 > Minneapolis, Minnesota, City Directory, 1930 > 189. Harrison Colby, A genealogy of the descendants of Abraham Colby and Elizabeth Blaisdell, his wife, who settled in Bow in 1768, , at https://archive.org/details/genealogyofdesce00colb . Concord, N.H.: Printed by the Republican Press Association, (1895) Microfilm #896944 of the Family History Library, Salt Lake City, Utah, p. 133. The book lists the year as 1828, but this copy has it crossed out, and "1820" written in. "New Hampshire, Birth Records, Early to 1900," database with images, FamilySearch (https://familysearch.org/ark:/61903/1:1:FL2R-LLY : accessed 16 August 2015), Charles E Colby, 29 Apr 1878; citing Salem, Rockingham, New Hampshire, United States, Bureau of Vital Records and Health Statistics, Concord; FHL microfilm 1,000,378. 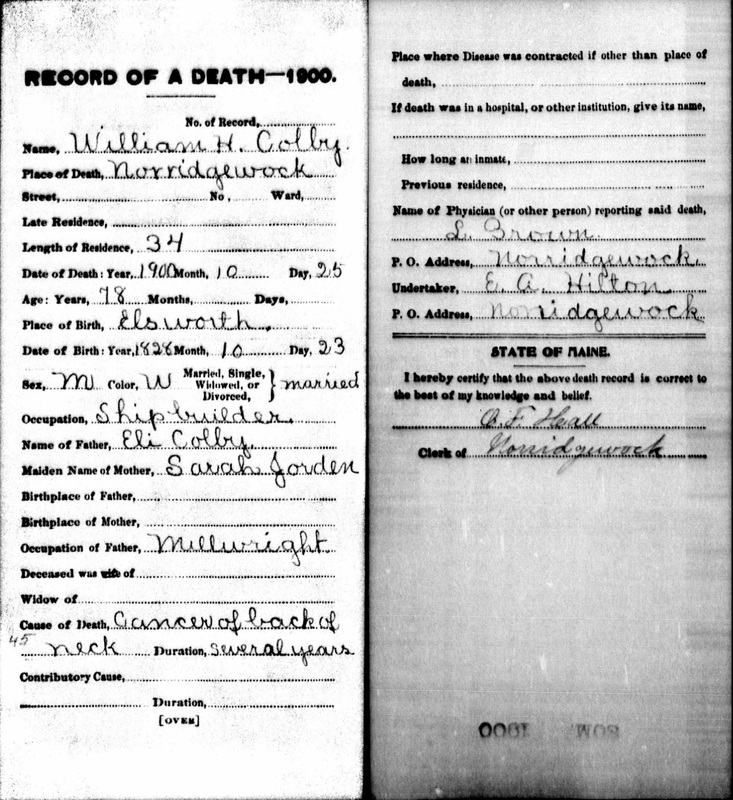 "New Hampshire, Death Records, 1654-1947," database with images, FamilySearch (https://familysearch.org/ark:/61903/1:1:FSKJ-G4T : accessed 17 August 2015), William G Colby, 28 Jan 1892; citing Salem, Bureau Vital Records and Health Statistics, Concord; FHL microfilm 1,001,068. Harrison Colby, A genealogy of the descendants of Abraham Colby and Elizabeth Blaisdell, his wife, who settled in Bow in 1768, , at https://archive.org/details/genealogyofdesce00colb . Concord, N.H.: Printed by the Republican Press Association, (1895) Microfilm #896944 of the Family History Library, Salt Lake City, Utah, p. 135. Maine State Archives; Cultural Building, 84 State House Station, Augusta, ME 04333-0084; 1892-1907 Vital Records; Roll #: 11. Richard W. Musgrove, History of the Town of Bristol, Grafton County, New Hampshire, Bristol, N. H.: R. W. Musgrove, (1904) , Vol. 2, p. 55. COLBY FAMILY & OTHERS at http://freepages.genealogy.rootsweb.com/~colby/colbyfam, /d222.html. 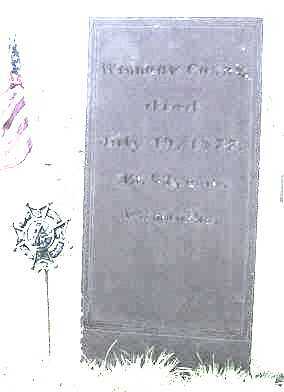 Williby died between March 8, 1791 and 1795 in Bow, Merrimack County, New Hampshire. Unknown volume, NH Births: from F. E. Colby, clerk of Bow, NH, 28 Oct 1905, unknown repository, unknown repository address. Harrison Colby, A genealogy of the descendants of Abraham Colby and Elizabeth Blaisdell, his wife, who settled in Bow in 1768, , at https://archive.org/details/genealogyofdesce00colb . Concord, N.H.: Printed by the Republican Press Association, (1895) Microfilm #896944 of the Family History Library, Salt Lake City, Utah, p. 24. Harrison Colby, A genealogy of the descendants of Abraham Colby and Elizabeth Blaisdell, his wife, who settled in Bow in 1768, , at https://archive.org/details/genealogyofdesce00colb . Concord, N.H.: Printed by the Republican Press Association, (1895) Microfilm #896944 of the Family History Library, Salt Lake City, Utah, p. 25. Willie died on March 22, 1884 in Manchester, Hillsborough County, New Hampshire. 1880 United States. Census Office. 10th census, 1880 federal population census, Washington, District of Columbia: National Archives and Records Service, ([19--]) , FHL Film 1254557 National Archives Film T9-0557 Page 32C. Harrison Colby, A genealogy of the descendants of Abraham Colby and Elizabeth Blaisdell, his wife, who settled in Bow in 1768, , at https://archive.org/details/genealogyofdesce00colb . Concord, N.H.: Printed by the Republican Press Association, (1895) Microfilm #896944 of the Family History Library, Salt Lake City, Utah, p. 138, #458. "New Hampshire Marriage Records, 1637-1947," database with images, FamilySearch (https://familysearch.org/ark:/61903/1:1:FL6K-RF2 : accessed 6 April 2016), Raymond W. Colby in entry for Willis Henry Colby and Arlene Francis Dudley, 13 Sep 1941; citing Concord, Merrimack, New Hampshire, Bureau of Vital Records and Health Statistics, Concord; FHL microfilm 2,319,637. "New Hampshire Death Certificates, 1938-1959," database with images, FamilySearch (https://familysearch.org/ark:/61903/1:1:QV37-M1MH : accessed 6 April 2016), Willis Henry Colby, 21 Nov 1958; citing Chichester, Merrimack, New Hampshire, United States, p. No 5429-5923, New Hampshire Division of Vital Records, Concord. "United States Census, 1920," database with images, FamilySearch (https://familysearch.org/ark:/61903/1:1:MH8R-626 : accessed 6 April 2016), Raymond W Colby, Concord Ward 6, Merrimack, New Hampshire, United States; citing sheet 2B, NARA microfilm publication T625 (Washington D.C.: National Archives and Records Administration, n.d.); FHL microfilm 1,821,013. Ezra S. Stearns, Genealogical and family history of the state of New Hampshire, Vol. 4, , at https://books.google.com/books?id=PHPLT1QY9LQC . New York and Chicago: Lewis Publishing Company, (1908) , p. 1568. Vital records of Amesbury, Massachusetts to the end of the year 1849, , at https://archive.org/details/vitalrecordsofam00ames . Topsfield, Mass. : Topsfield Historical Society, (1913) , p. 67. Frederick Lewis Weis, The Colby family in early America; early generations of the descendants of Anthony Colby of Boston, Cambridge, Salisbury and Amesbury, Massachusetts, 1595-1661, , at https://books.google.com/books?id=TXdGAAAAMAAJ . Caledonia: The Colonial Press, (1970) , pp.104-5.